Cochin Shipyard Ltd (CSL) today said it has emerged as the lowest bidder for a project of the Indian Navy and the Rs 5,400 crore contract for eight vessels is likely to be concluded after due process. “CSL has received communication from the Integrated Headquarters, Ministry of Defence (Navy) that the Company has emerged as the L1 bidder for 16 X ASW SWC Project for the Indian Navy,” the company said in a filing to BSE. The contract for eight vessels at a cost of about Rs 5,400 crore is expected to concluded with the Ministry of Defence after due process, it said. The company said the order bagged against a competitive tender issued by the ministry in which both private and public sector yards had participated. CSL is the only shipyard in India that can build up to 1,10,000 DWT (deadweight tonnes) with a track record of making tankers, bulk carriers, port crafts and passenger vessels, among others. The company is into constructing platform supply vessels for exports and aircraft carrier for the Indian Navy. According to CSL, it is the only shipyard in the country which can fix vessels up to 1,25,000 DWT, and repair an air defence ship. India’s first indigenous aircraft carrier, INS Vikrant, is in its final stage of construction at CSL. CSL completed its landmark IPO in August, attracting more than Rs 1.11 lakh crore as against the offer size of Rs 1,442 crore. The company, which is under the shipping ministry, was listed on BSE and NSE on August 11 this year. The CSL stock gained nearly 11 per cent to close at 572.40 on BSE. 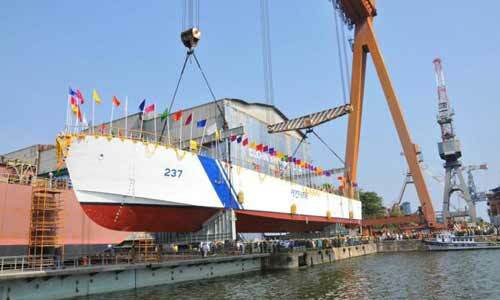 Be the first to comment on "Cochin Shipyard lowest bidder for Rs 5,400 crore Navy contract"